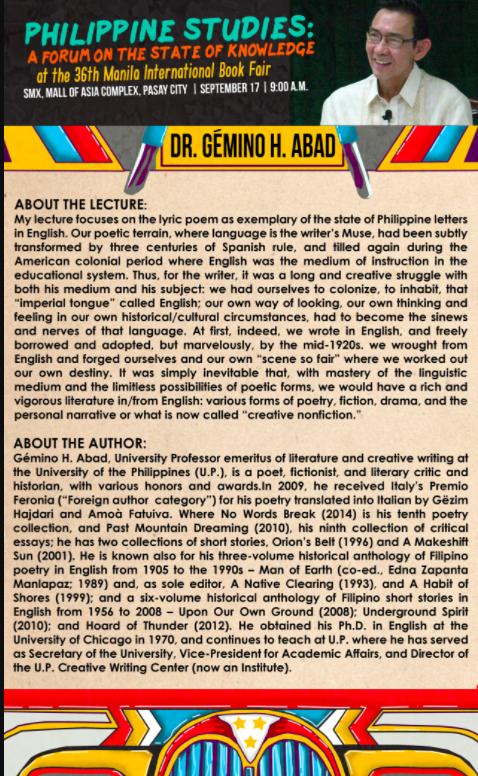 Catch Dr. Gemino H. Abad’s lecture on the state of Philippine letters at the 36th Manila International Book Fair! The University of the Philippines Press, the country’s oldest university press, in partnership with the National Book Development Board, will be holding a one-day symposium entitled “Philippine Studies: The State of the Knowledge” as part of..
its golden anniversary celebration. The event will be held at the 36th Manila International Book Fair on September 17, 2015, 9:00 a.m., at the SMX Convention Center, Mall of Asia Complex, Pasay City, and will feature paper presentations by six of its authors who are recognized leading experts in their respective fields. Each speaker will be giving a report on the state of knowledge of his or her own discipline. Speakers from the social sciences are sociologist Dr. Raul Pertierra, anthropologist Dr. Michael Lim Tan, and historian Dr. Ferdinand Llanes. Reports on the state of Philippine literary studies will be given by Dr. Gemino H. Abad and National Artist Bienvenido L. Lumbera, and, speaking on the state of the natural sciences in the country will be Dr. Gisela Padilla-Concepcion, University of the Philippines Vice-President for Academic Affairs. To all confirmed participants, kindly check your e-mail for updates and reminders. Thank you. 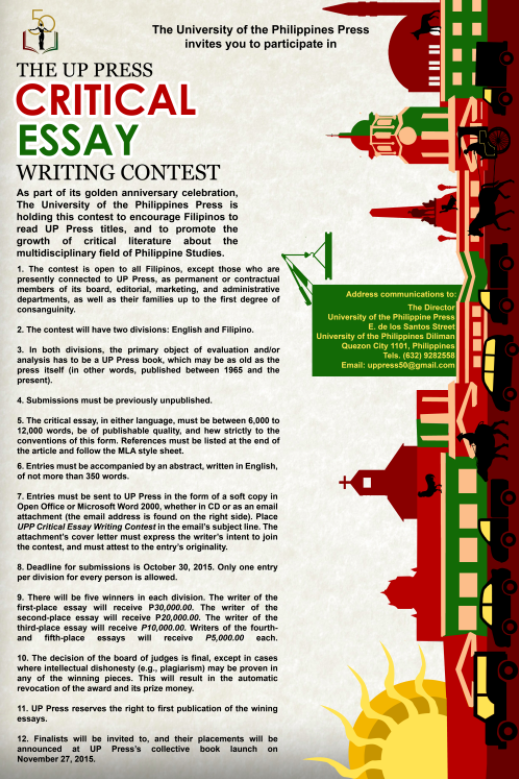 As part of its golden anniversary celebration, The University of the Philippines Press is holding The UP Press Critical Essay Writing Contest to encourage Filipinos to read UP Press titles, and to promote the growth of critical literature about the multidisciplinary field of Philippines Studies. Download contest poster for details. 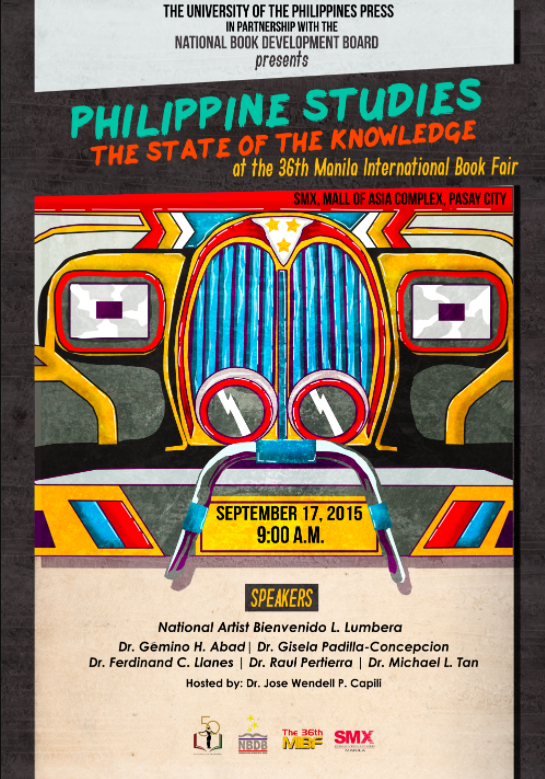 The country’s biggest book event is happening this September. We’ll see you there! 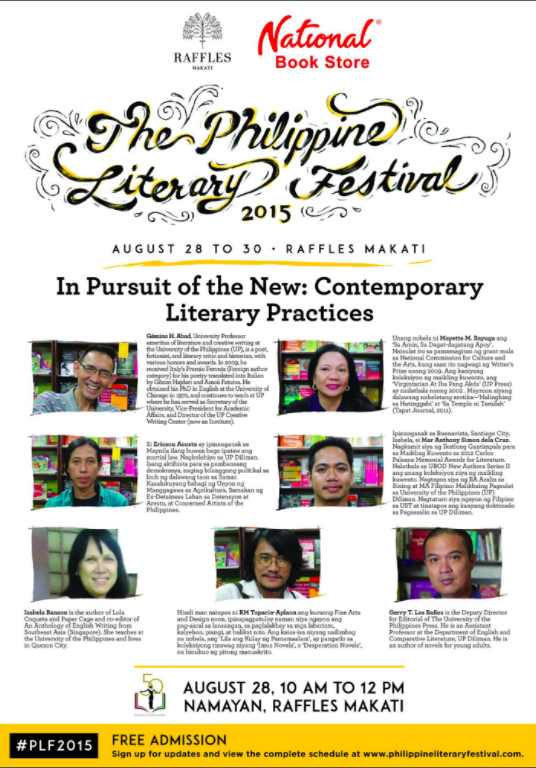 UP Press joins National Book Store’s The Philippine Literary Festival with a session on In Pursuit of the New: Contemporary Literary Practices. In the panel are authors Gemino H. Abad, Isabela Banzon, Ericson Acosta, Mayette M. Bayuga, Mar Anthony Simon Dela Cruz, and RM Topacio-Aplaon with Gerry T. Los Banos as moderator. Session will be on August 28, 2015, 10 a.m. to 12 n.n. at Namayan, Raffles Makati. Admission is Free. 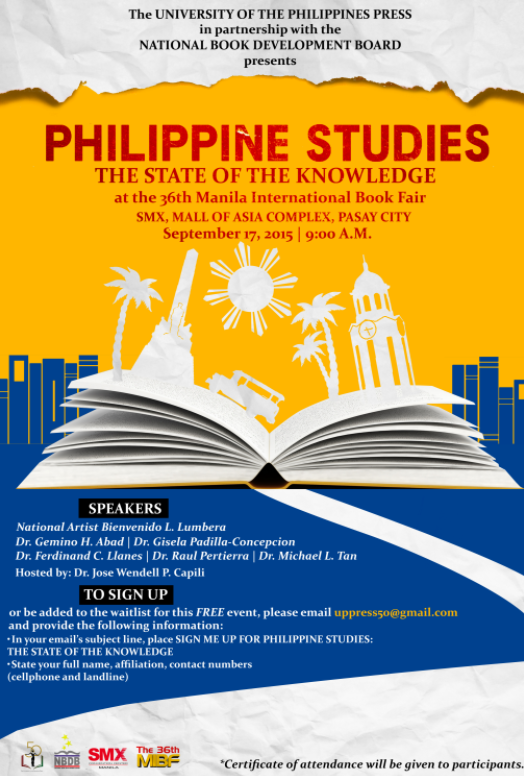 The University of the Philippines Press, the country’s oldest university press, in partnership with the National Book Development Board, will be holding a one-day symposium entitled “Philippine Studies: The State of the Knowledge” as part of its golden anniversary celebration. 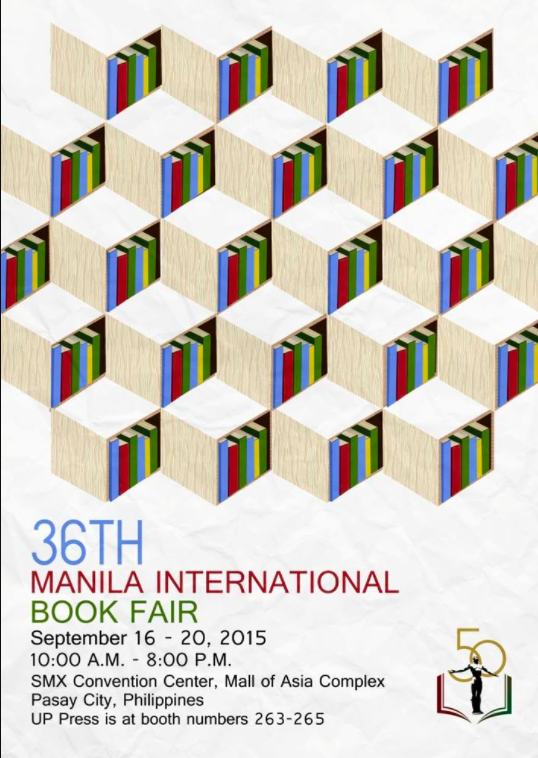 The event will be held at the 36th Manila International Book Fair on..
September 17, 2015, 9:00 a.m., at the SMX Convention Center, Mall of Asia Complex, Pasay City, and will feature paper presentations by six of its authors who are recognized leading experts in their respective fields. Each speaker will be giving a report on the state of knowledge of his or her own discipline. Speakers from the social sciences are sociologist Dr. Raul Pertierra, anthropologist Dr. Michael Lim Tan, and historian Dr. Ferdinand Llanes. Reports on the state of Philippine literary studies will be given by Dr. Gemino H. Abad and National Artist Bienvenido L. Lumbera, and, speaking on the state of the natural sciences in the country will be Dr. Gisela Padilla-Concepcion, University of the Philippines Vice-President for Academic Affairs. The symposium will be having a morning (9:00 a.m. to 12:00 n.n.) and afternoon (2:00 p.m. to 5:00 p.m.) session. Advance registration is now open and will close August 15, 2015 (or when the desired number of participants is reached). The symposium is free of charge and certificates of attendance will be given to participants. Participants are requested to pre-register for the event due to the venue’s limited space. See poster for pre-registration details. 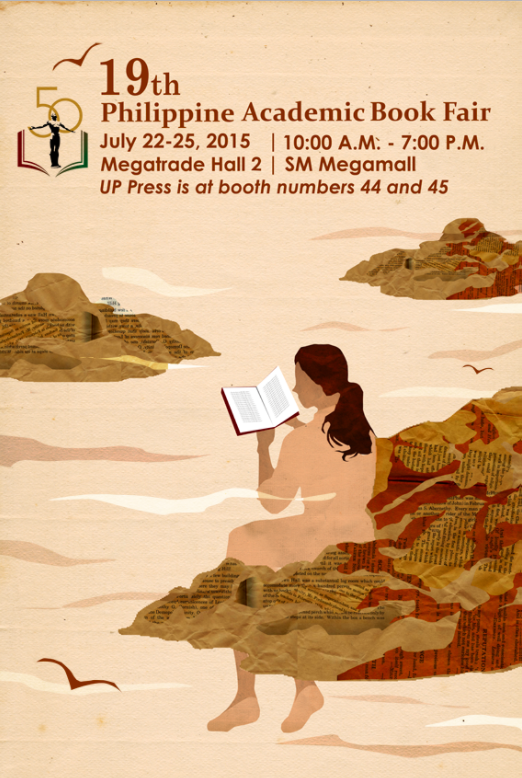 Catch the UP Press at the 19th Philippine Academic Book Fair! April 17, Friday, 5 p.m. at the Balay Kalinaw, UP Diliman. U.P. Press will be having a Book sale on March 2 to 31,2015. 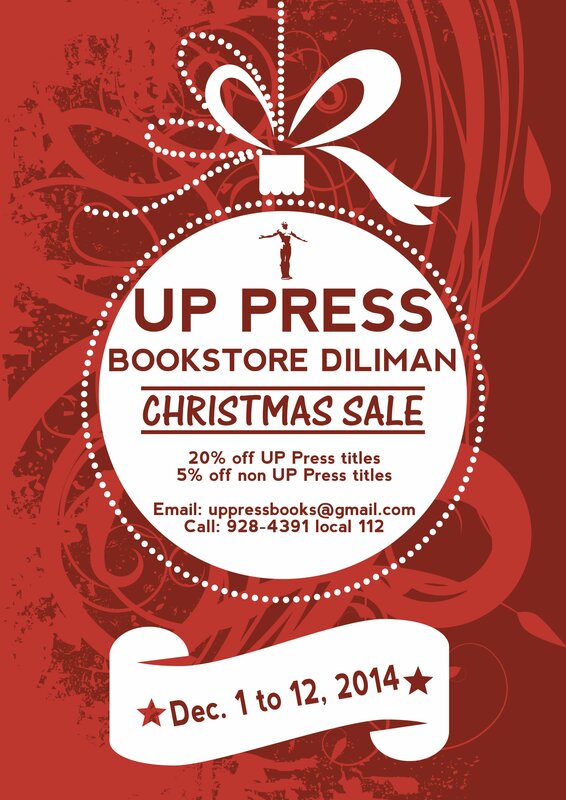 UP Press titles will be 20% off while non-UP Press titles will have a 5% discount. 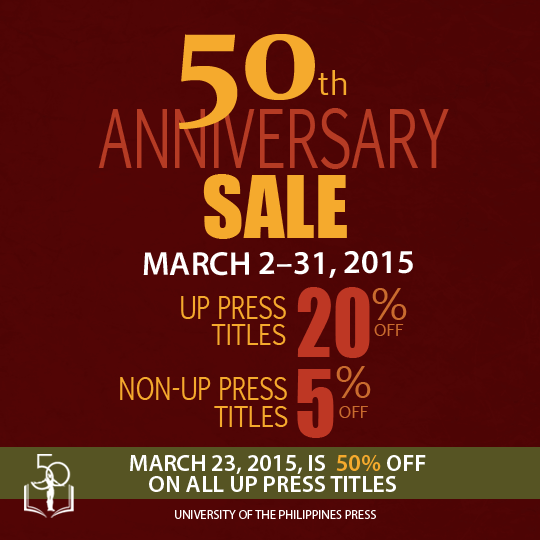 On March 23, 2015, All UP Press Titles will have a discount of 50%. TOPAZ ARTS welcomes guest artist Rina Angela Corpus who will talk about her book, “Defiant Daughters Dancing: Three Independent Women Dance,” (UP Press) which won her..
the University of the Philippines Center for Women’s Studies Award for Outstanding Thesis in 2006. The reading will take place on Saturday, September 29, 2012 from 4-6pm at TOPAZ ARTS located at 55-03 39th Avenue in Woodside, Queens, NY. Subway: #7 to 61st St; R/M to Northern Blvd; or LIRR to Woodside Station; details and directions available at www.topazarts.org. Admission is free. Corpus’ book navigates the histories of three contemporary Filipina choreographers – Myra Beltran, Kristin Jackson, Agnes Locsin – who have bravely produced themselves as independent dance-makers. Using feminist prisms in looking at women’s history in the dance world, the book lays down concrete questions and practical methodologies for mapping out a dance historiography that is informed by self-reflexivity and feminist consciousness. Straddling the discourses of art and dance history, feminist criticism, theory and aesthetics, this book is a first of its kind in Philippine dance scholarship that contemplates the depth and breadth of feminist thought within the study of Philippine contemporary dance. Author Rina Angela Corpus will be joined by choreographer Kristin Jackson and Marie Alonzo- Snyder, PhD, Filipina-American dancer and dance educator, to offer commentary after the talk. The book will be available at the reading. Research in Dance Education, Peace Review: Journal of Social Justice, Philippines Free Press, Manila Bulletin and the Philippine Daily Inquirer. 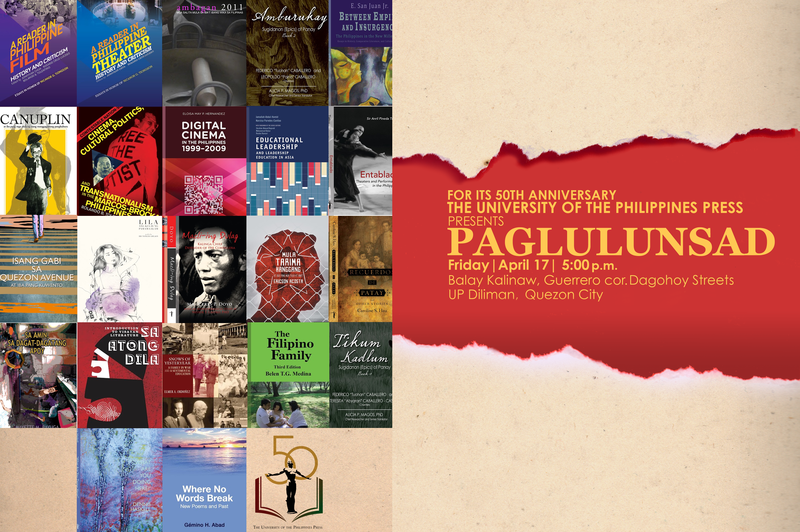 The University of the Philippines Press launched twelve new titles last August 23, 2013 at the Balay Kalinaw, UP Diliman. Fiction made by Filipinos for Filipinos are featured in Diaspora Ad Astra: An Anthology of Science Fiction from the Philippines edited by Emil M. Flores and Joseph Frederic F. Nacino and The Farthest Shore: An Anthology of Fantasy Fiction from the Philippines edited by Dean Francis Alfar and Joseph Frederic F. Nacino. Social and cultural anthropologist Analyn V. Salvador-Amores gives the readers a unique account of the tattooing practices of the Kalinga people in northern Luzon in her book Tapping Ink, Tattooing Identities. UP Film Institute Professor Emeritus Nicanor G. Tiongson releases The Urian Anthology 2000-2009: The Rise of the Philippine New Wave Indie Film which highlights the most important cinematic phenomenon of the decade. This book is a sequel to The Urian Anthology 1990-1999. Mindanao on My Mind and Other Musings is a collection of essays that spans nearly three decades of insights from Davao resident Nikki Rivera Gomez. The first two decades of armed conflict and peace building in post-Marcos Philippines is discussed in-depth in Costly Wars, Elusive Peace, written by Miriam Coronel Ferrer, chief negotiator of the government’s peace panel for the Moro Islamic Liberation. Isaac Donoso, author of Islamic Far East: Ethnogenesis of Philippine Islam, attempts to integrate the Islamization phenomenon from the four corners of the world, and locate the beginnings of Islamization in the country. Journalist, essayist, poet, and documentary filmmaker Sylvia L. Mayuga comes out with another essay anthology in Virtual Nation: Insights into Contemporary Philippines. Take a trip with Shane Carreon as she invites readers to journey into one’s self as well as into the world in her book entitled Travelbook: Poems. Kulas Talon shared his imaginative expedition in Shockbox: Ang Butas na Kahon ni Kulas Talon. His poems are written in Filipino with English translations. Having worked for the Central Azucarera in Tarlac, Gelacio Guillermo wrote his poems for and about the masses in the Azucarera in Mga Tula. Introduction to Statistics and Econometrics, second edition, is a popular textbook used by beginning econometrics student. This award-winning book is written by Rolando A. Danao, Professor Emeritus from the UP School of Economics. For orders and inquiries, call the UP Press Bookstore at +63 (2) 928-4391 local 112 or e-mail [email protected] or connect via facebook and twitter. The UP Press will be launching nine new titles on April 04, 2014, 5:00 pm at the West Wing Gallery of the Vargas Museum.